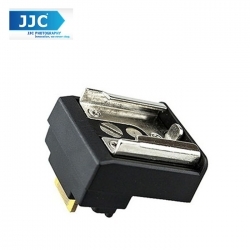 JJC MSA-10 is a hot shoe adapter designed for use with the Sony NEX cameras inbuilt Smart Accessory Terminal. This adapter enables users to attach any wireless trigger system or flash unit onto the SONY NEX-3, NEX-C3, NEX-F3, NEX-3N, NEX-5, NEX-5N, NEX-5R. The hot shoe mount is designed to fire your flashes with a proper radio trigger attached. While it is possible to attach a flash unit directly onto the hot shoe, it is not recommended as the weight of the flash may not be fully supported by the mount. MSA-10 is designed for the flash with trigger voltage 60V or lower. Please do not use the flash with trigger voltage over 60v, it might damage your camera or MSA-10 adapter. SONY NEX-3, NEX-C3, NEX-F3, NEX-3N, NEX-5, NEX-5N, NEX-5R.